If our eyes could see radio waves, the nearby galaxy Centaurus A would be one of the biggest and brightest objects in the sky, nearly 20 times the apparent size of a full moon. Human eyes can see wavelengths between 0.00004 and 0.00008 of a centimeter (where, not surprisingly, the Sun and stars emit most of their energy). The human visual spectrum from violet to red, notes astronomer, James Kaler, is but one octave on an imaginary electromagnetic piano with a keyboard hundreds of kilometers long. What we can't see when looking at the galaxy in visible light is that it lies nestled between a pair of giant radio-emitting gas plumes ejected by its supersized black hole. Each plume is nearly a million light-years long. NASA's Fermi Gamma-Ray Space Telescope maps gamma rays, radiation that typically packs 100 billion times the energy of radio waves. Nevertheless, and to the surprise of many astrophysicists, the plumes show up clearly in the satellite's first 10 months of data. 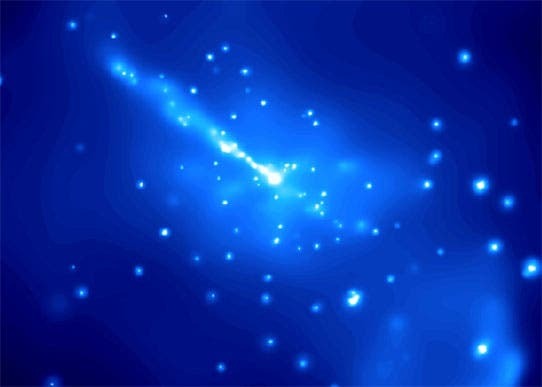 "This is something we've never seen before in gamma rays," said Teddy Cheung, a Fermi team member at the Naval Research Laboratory in Washington. "Not only do we see the extended radio lobes, but their gamma-ray output is more than ten times greater than their radio output." If gamma-ray telescopes had matured before their radio counterparts, astronomers would have instead classified Cen A as a "gamma-ray galaxy." Also known as NGC 5128, Cen A is located about 12 million light-years away in the constellation Centaurus and is one of the first celestial radio sources identified with a galaxy. 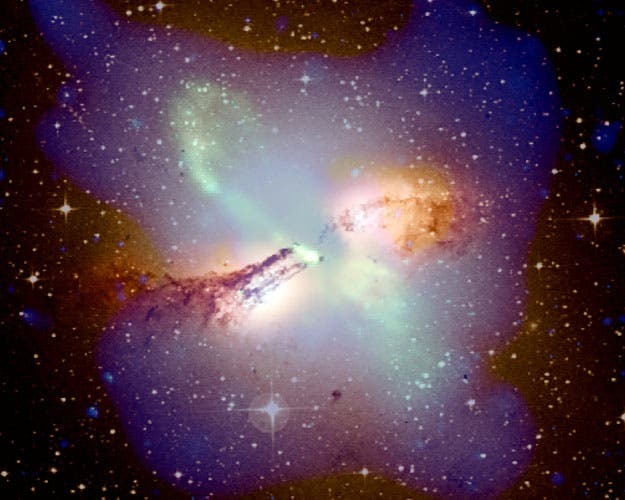 "A hallmark of radio galaxies is the presence of huge, double-lobed radio-emitting structures around otherwise normal-looking elliptical galaxies," said Jürgen Knödlseder, a Fermi collaborator at the Center for the Study of Space Radiation in Toulouse, France. "Cen A is a textbook example." Astronomers classify Cen A as an "active galaxy," a term applied to any galaxy whose central region exhibits strong emissions at many different wavelengths. "What powers these emissions is a well-fed black hole millions of times more massive than our sun," said Yasushi Fukazawa, a co-author of the study at Hiroshima University in Japan. "The black hole somehow diverts some of the matter falling toward it into two oppositely directed jets that stream away from the center." Fueled by a black hole estimated at hundreds of millions of times the sun's mass, Cen A ejects magnetized particle jets moving near the speed of light. Over the course of tens of millions of years, these jets puffed out two giant bubbles filled with magnetic fields and energetic particles — the radio lobes we now see. The radio waves arise as high-speed electrons spiral through the lobes' tangled magnetic fields. The entire universe is filled with low-energy radiation — radio photons from the all-pervasive cosmic microwave background, as well as infrared and visible light from stars and galaxies. The presence of this radiation is the key to understanding Cen A's gamma rays. "When one of these photons collides with a super-fast particle in the radio lobes, the photon receives such an energy boost, it becomes a gamma ray," explained co-author Lukasz Stawarz at the Japan Aerospace Exploration Agency in Sagamihara, Japan. Although it sounds more like billiards than astrophysics, this process, called inverse Compton scattering, is a common way of making cosmic gamma rays. For Cen A, an especially important aspect is the case where photons from the cosmic microwave background ricochet off of the highest-energy particles in the radio lobes. In dozens of active galaxies, this process has been shown to produce X-rays. But the Cen A study marks the first case where astronomers have solid evidence that microwave photons can be kicked up to gamma-ray energies. Fermi cataloged hundreds of blazars and other types of active galaxies in its first year. Before its mission ends, that number may reach several thousand. But because Cen A is so close, so large and so vigorous, it may be the only active galaxy Fermi will view this way. Image below: Fermi's Large Area Telescope resolved high-energy gamma rays from an extended region around the active galaxy Centaurus A. The emission corresponds to million-light-year-wide radio-emitting gas thrown out by the galaxy's supersized black hole.